If you are thinking of buying a microwave to use when caravanning, take a close look at the features they offer and which one is best suited to your needs. One point to remember is that a microwave uses a lot of power and you will always have to check which electrical appliances are being used at the same time as the microwave as you may blow the electricity supply! If, for instance, the fridge and television were being used at the same time as your microwave, this may be enough to overload the circuit. You will also need to remember that a microwave uses extra power when it starts up - so double the wattage quoted on the microwave for this. If you are worried about the amount of electricity you will be using with the microwave perhaps you would be better off buying a microwave with low power. Caravan accessory shops will be able to advise you further when looking for a low power microwave. Microwaves nowadays do have many different features and thus prices do vary widely. 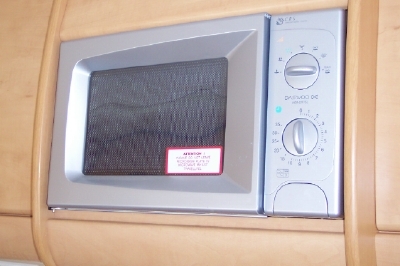 Solo microwave (not a combination one) for just basic microwaving e.g. jacket potatoes, soup. Remember that a solo microwave will not brown the food. Combination Microwaves use convection heating (hot air) as well as a grill, so you are able to use microwaves, a grill and convection heating which will brown food as well as cook it. Remember that a combination microwave will use much more power than just a basic microwave. Grill Microwaves are basic microwaves with a grill to brown the food as well. They usually come with a metal shelf to put the food on when you are grilling. Auto Reheat Buttons allow you to enter the weight of the food you are cooking into the microwave and it will calculate how long it needs to cook the food for. Button Operated Door Opening allows you to open the microwave to stop it from cooking and is easier than having to pull the door open. Programmable Timer - this lets you select from a menu of cooking and timer options. Timers - you can get either manual or digital. A digital timer is a lot more precise than a manual one. Easy Clean Interior - we all want a microwave which has a smooth interior which makes it much easier to clean, don't we? Audible Signals - listen to the beeps before you buy. You don't want to buy a really annoying one! Audible signals are a good feature for the visually impaired. What Can I Use Inside the Microwave? DO NOT use anything metallic, not even gold or silver patterned crockery. You CAN use most plates and dishes (no cracks) and most plastics except melamine. Pyrex is suitable, but the heavy sort will extract a lot of heat from the food and extend cooking times. Use lighter containers for faster cooking. "Microwave Safe" on a container means that it's material will not be heated by microwaves, which is almost essential. To see how to test for microwave suitability, read the following feature. The one minute test described below is essential before using any crockery with a coloured pattern as it might get searingly hot. When buying a microwave remember, a microwave oven is not just a re-heater. It can cook plenty of fresh, healthy caravan food - if you know how to do it. This will get you off to a good start, and guide you toward microwave mastery. Choose a well known brand such as Panasonic, Sharp, or Samsung, but be aware that new microwave ovens branded Kenwood or Belling are not connected with those prestigious companies. The market is flooded with very cheap microwave ovens, sold under countless names. Typically, you can't get parts for those. So you might have to scrap one that fails out of warranty - or sooner if you smash its glass tray, or break a plastic door hook. Basic models are OK. You may hear that they can't cook food. Nonsense. All microwave ovens can cook. It's mostly down to the skill and knowledge of the user. Mechanical controls (knobs) are good, but they are now only on cheap models with no start buttons. So if the door is shut after removing the food - with time to go, they start up again - running empty. This can cause oven damage, and possibly a fire. So electronic controls it must be, preferably with a digital timer knob. Here's a tip. Never use a wet cloth on a touch control panel. Moisture may get in around the edges and make it inoperable. Always use a wax spray, which will seal the edges. As your only oven, a combination model could make sense, but bear in mind that while it is doing oven work, it is not available for microwave work - and vice versa. These need about 3 kw of power. The power (watts) needed by a pure microwave model is around twice its rated output, but don't be fooled by this. For moderate amounts of food, microwave ovens are highly efficient and cheap to run. That's because they use electricity roughly in proportion to the work they do. Of course, it's different with a combination model when it is using its heating elements, though they won't be on all the time. Like some free cookware? Certain throw-away food containers are very suitable for microwave use. The thicker plastics with a waxy feel are best, preferably without corners - tell the cookware people. Avoid the thin crinkly sort. To test any intended container, put it (empty) in the microwave oven beside half a cup of cold water, and apply full power for about a minute. If nothing happens to the test piece, it will probably serve you well. Don't do this with metallic or melamine items. If you overload your power supply, voltage drop may affect microwave performance. Heating power can reduce more than supply voltage has dropped. A serious overload can result in greatly extended heating times. For this reason, and others, NEVER RELY ON TIMINGS. Before serving food, make sure it is properly cooked and really hot. Check its temperature deep down with a probe thermometer, as they do in the catering trade. For safe eating, food temperature should be above 70 deg C.
Beware small items with a lot of sugar or fat in them, things like mince pies. They may need only a few seconds, so stay with them. If you go off and leave them heating, you may return to a wrecked microwave oven, a caravan filled with smoke, or even a caravan on fire. Watch all fast heating food, and make sure you are poised ready to open the oven door. That will instantly stop the microwaves. The most important thing to know about microwave cooking, is that it carries on after you turn off the microwaves. Food will finish cooking or heating all by itself, but if you apply microwaves until you think it's "done" , that extra, unstoppable cooking can ruin it. The secret of success is to know how much the food should be underdone when the microwaves are turned off, so it's something worth learning. There's no space here for everything you should know about owning and using a microwave oven, but you can have fun acquiring that knowledge. Pop into the nearest bookshop and order *Microwave for Certain. ISBN 1-873373-00-7 Published by Waveguide. *This paperback explains microwave ovens in a unique and entertaining way, with side splitting Besley cartoons. Unlike microwave cookbooks, it tells you how to get your food properly cooked and safe to eat without using timings. This unusual book makes good reading even if you are not cookery minded. * It's a gift at £4.45*. If you would like to recommend one to caravanners thinking of buying a microwave, please let us know and we will add it to this page. Look around all the shops and caravan accessory dealers before buying a microwave. We have always used a basic microwave in our caravan and, yes, we have blown the electricity a few times! It is a Cookworks White Touch Microwave - power output 700 watts, size 25.8cm (h) x 43.3cm (w) x 32.8cm (d) and it weighs 10.7 kgs. Phil says it is a good size and lightweight compared with most other microwaves. It has good features (but no grill). Many thanks for letting us know Phil - it is good to have products recommended by other caravanners!